Bronze has been in use since around 3500BC, originally used primarily for weapons and Armour as at the time it was a lighter alternative to leather & wood. Eventually, artists in the Chinese and West Asia began to use bronze in art as it was a lighter alternative to stone and could achieve more elegant poses. For this the artists invented the lost-wax process. Bronze is an alloy metal mostly made up of Copper with around 12% Tin and often additions of other metals such as Aluminium, Nickel, Zinc or Manganese. It can oxidize when it comes in contact with water or oxygen, and as such will turn green over time. This natural green patina is commonly known as ‘Verdigris’ and is aesthetically desirable to some peoples tastes and also lends itself to those looking for that ‘historic look’ which if placed in a new garden can help give the illusion of an established one. Example of Bronze patination showing Verdigris with fresh on left and aged on right. Bronze can be coloured (patinated) in almost any colour using a mixture of chemicals and heat with skilled timing and application. The finished patina is then coated in a protective wax which can be reapplied up to 3 times a year to maintain the original colouring. The amount of waxing required depends on the environment the sculpture will sit in; more humid and acidic places will require more frequent waxing, whereas if kept indoors will often require much less waxing if conditions are dry. The lifetime of a good bronze is almost forever! To this day archaeologists are still uncovering bronze statues from the Mediterranean Sea in good recognizable condition dating back thousands of years. DO NOT us any household detergents. Water alone is enough most of the time but if not, use a non-ionic or neutral detergent to remove any stubborn stains. Follow the products mixing guidelines and use a non-metallic bucket, rinse well after. We recommend using Antiquax or Renaissance wax. DO NOT use a car wax which may have abrasives in it or any other wax which isn’t recommended for bronze. Apply a thin layer to the surface of bronze using a circular motion. The area should become matte not shiny. Skilled experts are required if your bronze requires repatination or welding, here at the sculpture park we frequently use such experts to carry out restorations are are happy to provide details on request. 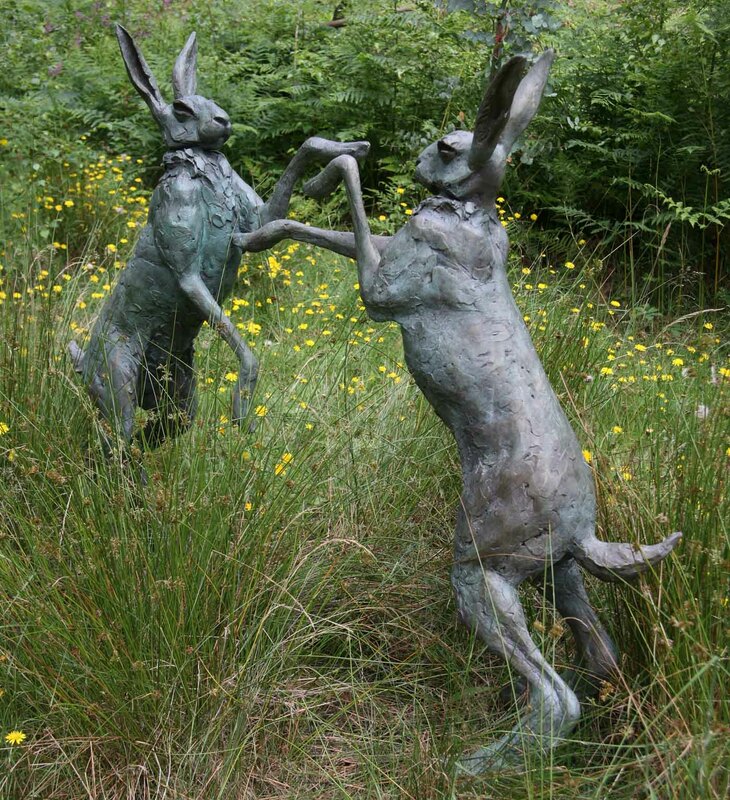 This entry was posted in and tagged Bronze Sculpture, Boxing Hares Sculpture, Hare Sculpture, Boxing Sculpture, Verdigris on 31st October 2016 by Charlie.